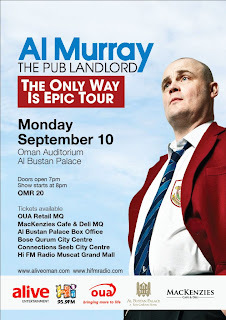 For 1 lucky reader, you can enter my competition to win a pair (Thats 2) free tickets to go and see the funny pub landlord himself in action on Monday night courtesy of the lovely people at Hi FM and Alive Entertainment. All you need to do is drop me an email with your name, or leave a comment here, and I'll enter your names into a hat and draw one at random. If you leave a comment here please be sure to leave a way for me to get in touch with you should you win! I'll announce the winner on Sunday afternoon! My brother in law's name is Alan Murray, but it isn't him. You may know him as he lived here in Muscat a few years ago. Please Please me me!!!! Such a great comic, its just Im too tight to buy tickets!!! Keen tenant looking for space at your Public House in Muscat. Is it too late? Is it too late?